Provided you're in the right suburb, chances are when you peer over your back fence you'll be looking at a Steller project under construction. The Carnegie-based outfit has made a habit of targeting suburban Residential Growth Zones with low-rise apartment projects - and very successfully. Steller has no less than 22 projects currently within the Urban Melbourne Project Database; based on database entries alone they are a veritable quantum leap ahead of the next. Steller's upswing can be attributed to a number of factors. Primarily, the developer focuses on 3-5 level apartment buildings across Melbourne's southern and eastern suburbs where owner-occupiers are currently all the rage. Working generally within the 20-40 apartment band per project, two and three bedroom options rule to roost. Single bedroom apartments few and far between. 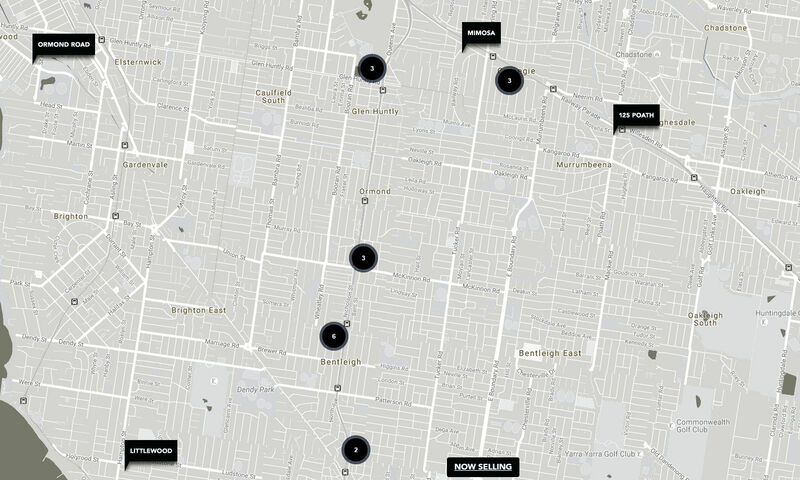 The slant toward oversized apartments in suburbs which are currently in favour sees Steller log 21 projects within the Urban Melbourne Project Database which are either at Registrations & Sales or Under Construction. Undoubtedly the developer has more up their sleeve as well which have yet to reach the public realm. The sum of all Steller listings within the Urban Melbourne Project Database amounts at 781 apartments; 36 apartments per project on average, or still well under any of a handful of individual inner city's super towers under construction which carry in excess of 1,000 apartments. Steller's success has also passed down to their architect of choice, Ewert Leaf. The South Melbourne practice sees a healthy proportion of their database listing attributed to Steller apartment projects. Steller's increased project exposure flows from the developer's relationship with two key partners, namely APN Property Group and OCP Asia. In partnership with APN, the duo have cemented a development partnership which will develop 223 apartments over six medium density projects. Insight is given by APN Property Group as to why their partnership (and by default Steller) is so successful. The manageable size of each project allows for an altogether nimble approach to development. Medium density projects with a fast turn around and lessened inherent risk, located in Residential Growth Zones surrounding public transport is the order of the day, and a recipe for success. The Australian reported mid this year that OCP Asia as Steller's second partner will provide finance to multiple apartment developments in the pipeline; roughly $800 million worth of apartments across ­Melbourne’s south eastern ­suburbs will benefit from the agreement. With the sheer volume of projects Steller has on the go, one thing's for sure...they will keep the Urban Melbourne Project Database ticking over for some time to come.